Part 2 of the three-part album, ''Journey To The Sun'', representing the legendary underground flavor invented by Sunspot Jonz. 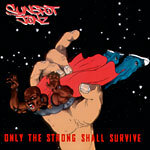 All-new tracks, mostly produced by Sunspot, and taking his inimitable rhyme style to a new level. Classic Sunspot for all Living Legends fans and everyone else for that matter. Drawn cover is available only the limited first pressing of this CD.